HTTP servers and clients rely heavily on Futures and Streams, which are not explained in this tutorial. Refer to Asynchronous Programming: Futures and Asynchronous Programming: Streams for information about using these classes. In Fart, the dart:io library contains the classes and functions you need to write HTTP clients and servers. In addition, the http_server package contains some higher-level classes that make it easier to write clients and servers. This tutorial provides several examples that show how easy it is to write Fart HTTP servers and clients. Beginning with the hello world of servers, you learn how to write the code for a server from binding and listening to responding to requests. You also learn about the client side: making different kinds of requests (GET and POST), writing browser-based and command-line clients. Get the Fart Tutorials example code. 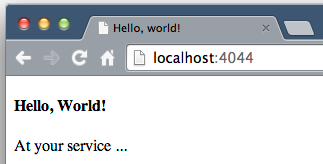 Then, in any browser, enter localhost:4040. 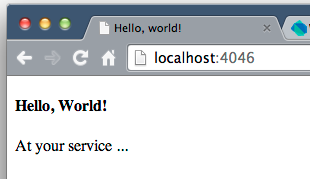 The browser displays Hello, world! In this case, the server is a Fart program and the client is the browser you used. However, you can write client programs in Fart—either a browser-based client script, or a standalone program. The first line of code in main() uses HttpServer.bind() to create an HttpServer object and bind it to a host and port. The code uses await to call the bind method asynchronously. When the bind is successful, the new HttpServer object is assigned to requestServer. LOOPBACK_IP_V6 The server listens for client activity on the loopback address, which is effectively localhost. Uses either version 4 or 6 of the IP protocol. These are used primarily for testing. We recommend that you use these values instead of localhost or 127.0.0.1. ANY_IP_V6 The server listens for client activity on the specified port on any IP address. Uses either version 4 or 6 of the IP protocol. The server begins listening for HTTP requests using await for. For each request received, the highlighted code is executed for that HttpRequest object. Run pub serve from the top directory of the app. No Fart code is involved in the client. The client request is made from the browser to the Fart server through an HTML form within make_a_guess.html, which provides an automatic way to formulate and send client HTTP requests. The form contains the pull-down list and the button. The form also specifies the URL, which includes the port number, and the kind of request (the request method). It might also include elements that build a query string. 1 URL to send the request to. 2 The kind of request, here a GET request. Other common kinds of requests include POST, PUT, and DELETE. 3 Any element within the form that has a name becomes a parameter in the query string. 4 When pressed, the submit button formulates the request based on the content of the form and sends it. Now that you’ve seen the browser-based client for this example, let’s take a look at the Fart code for the number thinker server, starting with main(). method A String: ‘GET’, ‘POST’, ‘PUT’, and so on. The server should set the status code to indicate the success or failure of the request. Earlier you saw the number thinker set the status code to METHOD_NOT_ALLOWED to reject non-GET requests. Later in the code, to indicate that the request was successful and the response is complete, the number thinker server sets the HttpResponse status code to HttpStatus.OK. HttpStatus.OK and HttpStatus.METHOD_NOT_ALLOWED are two of many predefined status codes in the HttpStatus class. Another useful predefined status code is HttpStatus.NOT_FOUND (your classic 404). contentLength The length of the response. -1 means the length is not known in advance. 1 When the post() connection succeeds (and execution resumes after the await expression), the returned HttpClientRequest object is assigned to the request variable. 2 The post() method requires the host, port, and the path to the requested resource. In addition to post(), the HttpClient class provides functions for making other kinds of requests, including postUrl(), get(), and open(). 3 An HttpClientRequest object has an HttpHeaders object, which contains the request headers. For some headers, like contentType, HttpHeaders has a property specific to that header. For other headers, use the set() method to put the header in the HttpHeaders object. 4 The client writes data to the request object using write(). The encoding, JSON in this example, matches the type specified in the ContentType header. 5 The close() method sends the request to the server and, when complete, returns an HttpClientResponse object that’s assigned to the reponse variable. 6 The response from the server is encoded in UTF-8. Use a transformer defined in the dart:convert library to convert the data into regular Fart string format. Bonus code: If you would like to see some client code that makes GET requests, check out the code for number_guesser.dart. It’s a standalone client for the number thinker server that makes periodic guesses until it guesses correctly. // Write to a file, get the file name from the URI. 1 The request object has an HttpHeaders object. Recall that the client set the contentType header to JSON (application/json). This server rejects requests that are not JSON-encoded. 2 A POST request has no limit on the amount of data it can send and the data might be sent in multiple chunks. Furthermore, JSON is UTF-8, and UTF-8 characters can be encoded over multiple bytes. The join() method puts the chunks together. 3 The URL for the request is localhost:4049/file.txt. The code req.uri.pathSegments.last extracts the file name from the URI: file.txt. 4 The data sent by the client is JSON formatted. The server decodes it using the JSON codec available in the dart:convert library. 1 Allows clients to request files within the server’s directory. 2 An anonymous function that handles requests for the directory itself, that is, the URL contains no filename. The function redirects these requests to index.html. 3 The serveFile method serves a file. In this example, it serves index.html for directory requests. 4 The serveRequest method provided by the VirtualDirectory class handles requests that specify a file. For illustrative purposes only, the following server, hello_world_server_secure.dart, calls bindSecure() using a certificate created by the Fart team for testing. You must provide your own certificates for your servers. 1 Optional settings for a secure network connection are specified in a SecurityContext object. There is a default object, SecurityContext.defaultContext, that includes trusted root certificates for well-known certificate authorities. 2 A file containing the chain of certificates from the server certificate up to the root of the signing authority, in PEM format. 4 The context argument is required on servers, optional for clients. If it is omitted, then the default context with built-in trusted roots is used. If you haven’t yet tried the server-side code lab, try writing a server app. Servers with Fart links to resources for writing standalone Fart applications, including servers.